Summer came late here, but as the ground dried up, we were able to get on the land, and top some of the meadowland which had not been cut because of the wet weather. The cattle like the sun on their backs, and have picked up, although one cow has required a lot of TLC to nurse her through a traumatic Caesarean operation to deliver her dead calf. Otherwise the calves are thriving, and starting to look very grown up, their yellow ear-tags looking far too large at this stage. The sheep have come through a terrible season for maggots, and with no more fly strike, and good grass, have picked up, although we still have 14 lambs which were not finished before the restrictions came in. vegetable garden is full of produce, beetroot, parsnips, peas and beans being particularly good. There are masses of autumn raspberries to compete with the blackberries in the hedge; and the apple crop is huge. 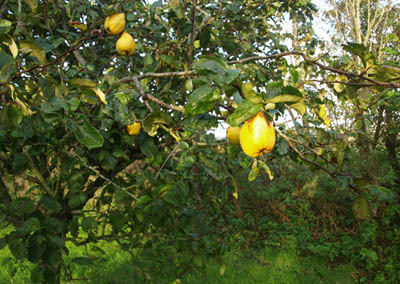 Even the quinces have done well – we just have to find something to do with them! This entry was posted on Sunday, September 23rd, 2007 at 1:06 pm and is filed under Diary. You can follow any responses to this entry through the RSS 2.0 feed. Both comments and pings are currently closed.